NEP worked with Pitt Studios staff on overall system design and final installation of the technical operations center and control rooms. 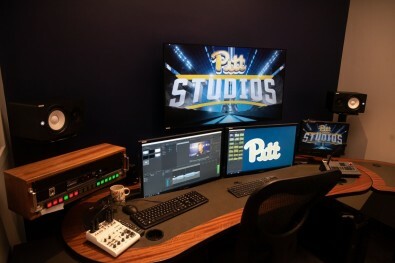 On Oct. 4th, Pittsburgh, Penn.-based NEP Group, a provider of outsourced production services, recently held a ribbon cutting on the campus of the University of Pittsburgh to open a new production facility called Pitt Studios that will support the production of the school’s college athletics telecasts. The grand opening included a tour of the 6,000 square foot $10 million broadcast facility. Located inside the school’s Petersen Events Center, Pitt Studios is the result of an on-going partnership between NEP and the school that includes an apprentice-training program to train future NEP broadcast engineers to work on live ACC Network broadcasts. NEP worked with Pitt Studios staff on overall system design, including equipment suggestions and final installation of the technical operations center and control rooms. In addition, this partnership includes naming of the “NEP Production Hub” at the location of the control rooms and editing suites. The facility features three redundant broadcast control rooms, multiple editing suites, and a main broadcast studio in the lobby of the Petersen Events Center. The facility is connected via fiber-optic cabling to the school’s main athletics venues, including Petersen Sports Complex, Fitzgerald Field House and Trees Pool, and will be responsible for over 100 ACC Network sports broadcasts per year. The new 6,000 square foot broadcast production facility features three redundant broadcast control rooms, multiple editing suites, and a main broadcast studio in the lobby of the Petersen Events Center. There is also a significant educational component to the project as Pitt Athletics has collaborated with the University of Pittsburgh Film and Media Studies Department to partially fund a faculty position and to aid in the creation of a broadcast curriculum, giving Pitt students a chance to observe and interact with broadcast professionals during live network broadcasts for ESPN. In addition, NEP Group has helped develop a co-op program that alternates classroom instruction with full-time fieldwork in broadcast engineering, through Pitt’s Swanson School of Engineering. Pitt athletic director Heather Lyke noted that the completion of the studio came in under budget and on time, for which she thanked Pitt’s partner NEP Group. Outside of the University of Pittsburgh, Pitt Studios will form an academic partnership with Point Park University, a leading educational provider for broadcast journalism and production. Point Park students will be interns working on the live ACC Network broadcasts. In addition, via the Pittsburgh Council on Higher Education’s cross registration program, Point Park instructors will be able to bring their students to an on-site classroom to monitor live broadcasts. The Atlantic Coast Conference (ACC) includes 15 Division-IA schools (e.g., Boston College, Clemson, Duke, Florida State, Georgia Tech, Louisville, Miami, North Carolina, Notre Dame, Pittsburgh, Syracuse and Wake Forest). Set to launch by August 2019, the ACC Network is a cable and satellite television channel owned by ESPN Inc., which has also reached a 20-year agreement to carry ACC games. Each ACC school will construct its own production facilities so they can contribute.